The small apartment bungalow CLAUDIO is located in a terraced residence, splendidly fitted in the enchanting area of the Natural Park "Alto Garda Brescian" located on the western lakefront of Lake Garda on the plateau of Tignale (about 700 m above sea level and about 500 m higher than the lake shore). The beaches of Lake Garda can be reached in a short time. During the summer, there is also a regular shuttle bus to Tignale beach. The cottage is ideal for all nature lovers, for relaxed and restful stays amidst beautiful meadows and forests. 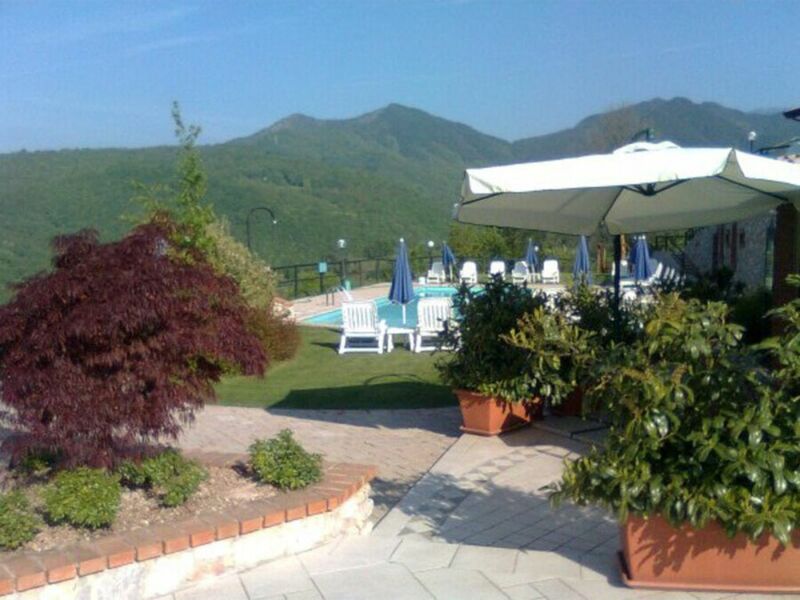 The residence is connected to many hiking and mountain bike trails from which you can enjoy fascinating views of Lake Garda and the massif of Mount Baldo. The residence has a large swimming pool, extensive lawns and playgrounds, is fenced and sheltered. Due to its exposed location, the climate is very pleasant even in high season. Living room with kitchenette and dining table (microwave with oven, toaster, espresso machine, satellite TV with German, Dutch, French, Spanish and English channels) and Italian channels. Bedroom with double bed and an additional bunk bed for a total of 4 people, in addition there is the possibility to use the double bed in the living room for another 2 people. Bedroom closet with safe. Small storage room. Large terrace with lake view, table and chairs, sun loungers - sun protection sail available. The swimming pool with a spacious lawn is located right next to the bungalow. There are 2 parking spaces within the residence. Located on a plateau between Campione and Gargnano on the western shores of Lake Garda, overlooking the entire lake and the magnificent massif of Monte Baldo, Tignale is considered one of the most fascinating places on Lake Garda. Medieval streets and churches of art-historical relevance in between cozy hotels, cafes and restaurants. The numerous small shops cover the supply of the community of high quality. The municipality extends from the lake up to the mountain peaks above the village and offers an extraordinarily varied landscape - ideal for any kind of sport in nature. Tignale is versatile and always creates new and enchanting scenarios. From the rugged landscape of the gorge of the torrent S. Michele, through the olive-covered mountain terraces between Piovere and Oldesio, extensive pastures with Eastern trees, dense forests, wide valleys and steep cliffs to the lake with its small fishing port and the historic Prà del la Fam lemon garden, which has been preserved and maintained and today serves as a museum in which the different phases of the traditional lemon growing are clarified. Lake Garda offers lovers of water sports a variety of opportunities. Numerous sailing schools teach children and adults the world of this wonderful sport. For motorboat lovers there are yards and moorings in nearby Gargnano. Deer, deer, ibex, golden eagle, squirrels, marmots and chamois are just a few of the numerous species of animals that populate the mountains around Tignale. Discover them on hikes through the nature park. The climatic and geological characteristics of the Tignale area have produced lush, typically sub-Mediterranean vegetation. Holm oaks, spruces, firs, beeches, hornbeams, oaks, cypresses, olives, magnolias, cedars, lemons, capers and palm trees ... A kind of eternal spring that regenerates body and mind. In addition to water sports you will find an Eldorado of mountain biking and cycling. If you like to conquer the mountain world by mountain bike, Tignale offers you an immense choice of more or less difficult or technically challenging trails. The landscape is extremely varied, as the area from the lake to an altitude of 1900 m ü.d. Cima Piemp, Passo Puria, Passo Fobia, Passo D'Ere, Bocca Paolone are just a few of the destinations worth exploring. Without olive oil hardly a dish is prepared here. Therefore, olive growers pay close attention to the quality of the oil. The olives from Tignale are traditionally from 100% organic cultivation. The ancient Romans planted olives in this microclimate and extracted oil from it. Even today, the fruit is harvested by hand as it was once, but cold pressed in a modern plant directly and without storage. The oil from Tignale has an extremely low acid content. The balanced taste and the velvety scent of olive oil is ideal for both fish and meat. In addition to the mackerel truffles, Tignale is also home to the excellent black perigord truffles, the summer truffles and, with a bit of luck, the burgundy truffles. A true experience for gourmets Tignale dedicates this year every year the first week of October. Mach einer abenteuerlichen Anreise wird man mit Ruhe und eknem rustikal eingerichtetem Apoartment belohnt. Wir kommen bestimmt wieder. Ca. 11 Autominuten vom Ortzentrum mit dem Auto über eine enge kurvenreiche Straße durch u.a. Wald. Ruhig und idyllisch gelegen, aber abends kurz zu Fuß einen Spaziergang in den Ort...leider zu weit. Aber wenn man seine Ruhe haben möchte ...SUPER! Pool schön, Garten, Blick auf Berge, toll! Located on a plateau between Campione and Gargnano on the western shores of Lake Garda, overlooking the entire lake and the magnificent massif of Monte Baldo, Tignale is considered one of the most fascinating places on Lake Garda. Medieval streets and churches of art-historical relevance in between cozy hotels, cafes and restaurants. The numerous small shops cover the supply of the community of high quality. Sport in Tignale next to the water sports you will find an Eldorado of mountain biking and cycling. If you like to conquer the mountain world by mountain bike, Tignale offers you an immense choice of more or less difficult or technically challenging trails. The landscape is extremely varied, as the area from the lake to an altitude of 1900 m ü.d. Cima Piemp, Passo Puria, Passo Fobia, Passo D'Ere, Bocca Paolone are just a few of the destinations worth exploring. Tignale can be found in addition to the mackerel truffles, the excellent black Perigord truffles, the summer truffle and, with a little luck, the Burgundy truffles. A true experience for gourmets Tignale dedicates this year every year the first week of October. Service fee / final cleaning once € 85,00. Consumption costs from 02. 05. to 09. 09. 2019 - Electricity / Gas € 25,00 / week. Consumption costs outside of the above times differ depending on the booking period. In the period from 08. 06.-23. 06. and 01. 07.-24. 08. 2019 is the regular stay 7 nights, gap bookings are different. City tax depending on the specification of the municipality is payable locally. Deposit € 300.00 secured by a valid credit card.